The ultimate vade-mecum to all these titles. What you have missed and what you are missing. The Oxford Symposium on Food and Cookery is perhaps the longest-running annual meeting and conference on these subjects in the world today. 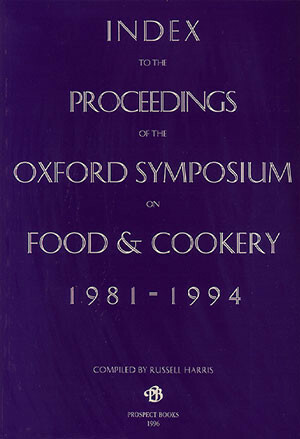 It sees a gathering of scholars and professionals from many different disciplines, each contributing their special knowledge to a single overriding theme – the food we eat and the way we eat it. Each year a volume of the essays and lectures delivered to the Symposium is produced, normally devoted to a single aspect of the subject. They have ranged from ‘Food in Motion’, to ‘Taste’, to ‘Disappearing Foods’, and ‘Public Eating’. An index to the cumulative set is an essential tool for any student or scholar working in this field. It has been published as a separate volume for the convenience of users, who may have to consult the proceedings themselves in a library or institution.